Namibian model Behati Prinsloo and Israeli model Bar Refaeli gave their millions of followers in social media another glimpse of their growing baby bumps. Both Victoria Secret models are expecting their first child. Prinsloo, who is married to hunky Adam Levine, posted a photo on Instagram of her bump in the bath. She captioned it with the whale emoji. ? This will be her first child with husband Adi Ezra. Neither can they be characterized as heavy or a whale in any shape or form but that is okay. That is what we women do when we are feeling the pressure or weight gain while pregnant. I love it when I notice other regions of the world that also have active movie celebrity culture engage in bump watch. It proves we are not the only ones out here obsessed with the incubation of the next generation of stars. This time, I spotted Information Nigeria‘s coverage of second time mom-to-be and Nollywood actress Mary Remmy Njoku at the London premiere of her latest project. The co-star to the latest film project by noted Nigerian film maker Obi Emolynyre wore a fuchsia halter dress with white beaded adornment in the bodice of the empire waist chiffon dress. Her loose ringlets were a great accompaniment to the formal look. Njoku’s co-star Mercy Johnson, who we covered also while pregnant a couple years ago, walked the red carpet too. The movie from Nigerian Thy Will Be Done showed at the on Thursday, February 26, 2015 at the BFI/IMAX theater in Waterloo, London, England. According to the report Mjoku and her husband Jason Njoku married in 2012 and welcomed their first child together Njoku in July 2013. The bump watch phenomenon isn’t unique to the United States and Western nations. Nope, anywhere there is an active movie and music industry (Nigeria, South Africa, India, Phillipines, Pakistan, etc), there is a corps of celebrities who get married and have babies. The buzz this weekend was about a sighting of Bollywood actress Sameera Reddy being spotted at the airport recently. The starlet, who married entrepreneur Akshai Varde in a very private wedding last January 2014, has been keeping low key, according to Indian gossip blogs. Sameera was last seen onscreen in the Kannada film Varadhanayaka, but remained private and cautious about the pregnancy, and is staying off radar for a spell. She looked cool, stylish and comfy in a striped t-shirt, framed with a black cardigan and worn with black tights and ballet flats. That’s the perfect airport and pregnant lady look, if you ask us. “Bump Watching” isn’t a uniquely American phenomenon. This weekend all eyes were on model-turned-actress Sarwat Gilani during Pakistan Fashion Week who appeared on stage at the Toni & Guy “Hair Meets Fashion” show sporting a visible bump in a shimmering sequined mini sheath dress and black shawl. Gilani, who has starred in a string of Pakistani TV dramas and her actor husband of just three months Fahad Mirza are expecting their first child together. Mirza said she will not let the pregnancy derail her career. We blogged a bit in the past how Bollywood actress and former Time magazine’s Most Beautiful Woman in the World Aishwarya Rai Bachachan‘s pregnancy led a lot of film producers to talk about inserting a no-pregnancy clause in casting contracts with female actors. Good for you, mama! Congrats! Nollywood Actress Ufoma Ejenobor looked fab as the cover model of the 20th issue of Nigerian pregnancy magazine Pregnancy and You magazine. The former Miss Nigeria and University of Lagos graduate has starred in several dozens straight-to video films. The former pageant model and hostess and her husband Steven McDermott had their first child in October 2012 shortly after taking cover photos for the magazine. 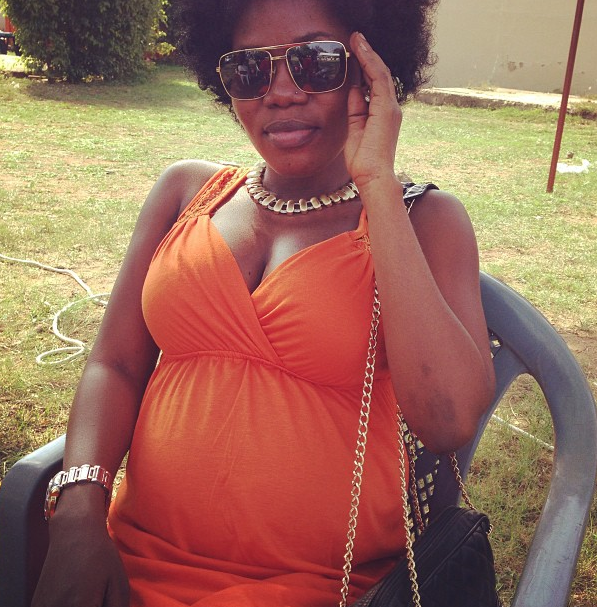 International Bump Watch: Ghanaian singer MzBel shows off her bump on Instagram! Ghanaian musician and actress Nana Ekua Amoah, more popularly known as Mzbel, is pregnant and has been sharing photos of her growing bump to her fans on her Instagram page. The singer, who has scored 16 hits, is expecting her first child but like our January Jones, she has been mum on who the dad is to her baby’s child. There was much speculation in Ghanaian press over whether she was pregnant early on and most recently who her child’s with most believing it is her on again-off again beau Ghanaian singer Maxwell. She has said that while she would have preferred to be married, she is happy to add to her brood which includes adopted kids 11-year old John and 5-year old Yullan. Sweet! She looks like she is carrying her pregnancy well and is rocking it in that orange and leopard skin outfit above! Read more about the tiny dynamo’s pregnancy, her decision to take time off, comparing her herself to Beyonce, Alicia Keys and Mariah Carey, and about becoming breathless while performing in Pretoria, South Africa during Ghanafest this year HERE! Is she or isn’t she? Pregnancy rumors and speculation are swirling around the world but the lady in question is saying nothing. This could easily be about a Hollywood star but this time, we’re talking about the world’s most reclusive nation, North Korea, and its first lady.